What happens when you put 2 artists that never met before together in the studio for 1 night? Benjamin Siksou and The Horndogz teamed up for the first episode of this musical experiment called “One Night Stand sessions”, recording 2 tracks together to be released alongside 2 tasty remixes on super limited edition maxi 12″ EP and digital download on Sep.23rd via Uptone Records. 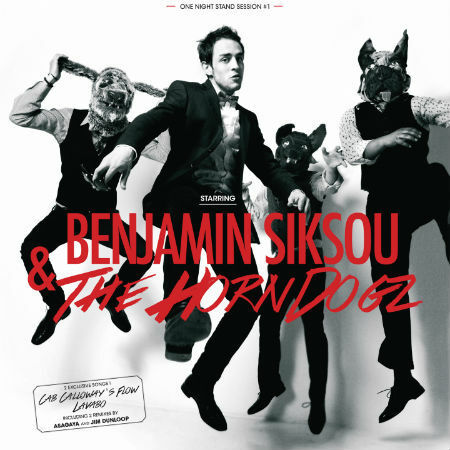 Though an almost 20 year gap separates them, both Benjamin Siksou and The Horndogz share a common passion for Afro-American music and funk & soul, making the result of this encounter something that is sure to delight lovers of the contemporary black music scene. Putting their own twist on the little known Serge Gainsberg gem “Lavabo” and composing original cut “Cab Calloway’s Flow” with 8 hands as a nod to the famous master from Harlem, the result of this little enterprise is quite fresh and surprising. The EP also contains 2 remixes of “Cab Calloway’s Flow”, by Asagaya and Jim Dunloop, out now in all the best stores!